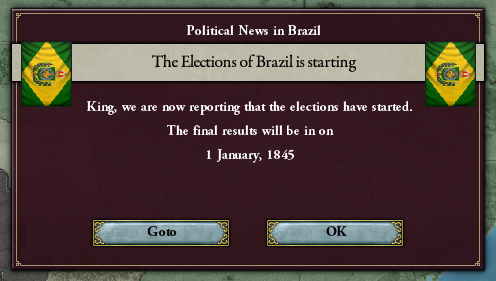 In the middle of '44, we prepare for our next election. The conservative coalition won by such a wide margin last time that it's hard to imagine them being unseated yet. Nevertheless, I try to guide our pops towards issues that either match up with views of my preferred political party by using the election events. I find it a little odd that the interval between elections seems to be 4 and a half years. I receive an event which allows me to either support a growing Temperance movement, or discourage it. I believe that both of these options can lead to bad things down the line, like repressive prohibition events on one end and drunken riots on the other. 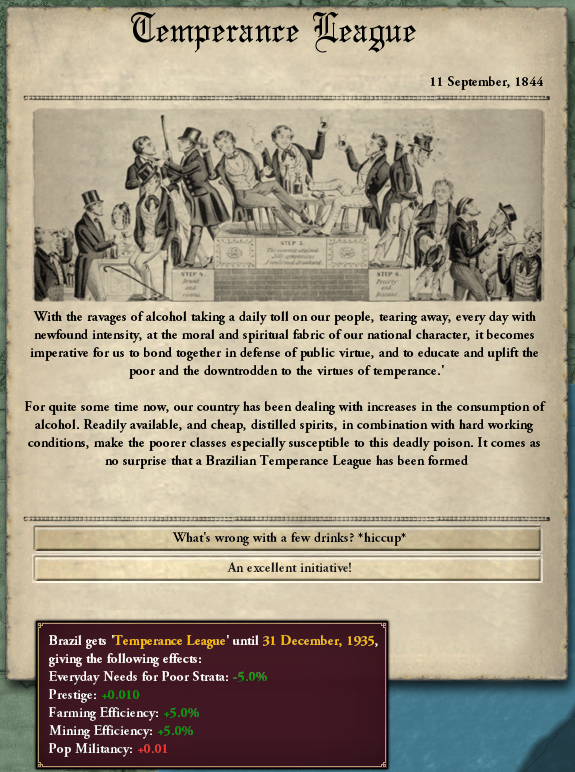 In this case, I support Temperance League in order to receive that small monthly bonus to prestige. This is also going to cause a small permanent monthly increase in militancy, though. 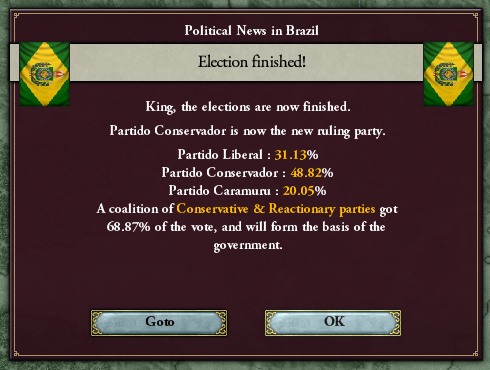 The election ends on January 1, 1845 and the Partido Conservador retains its strong support. 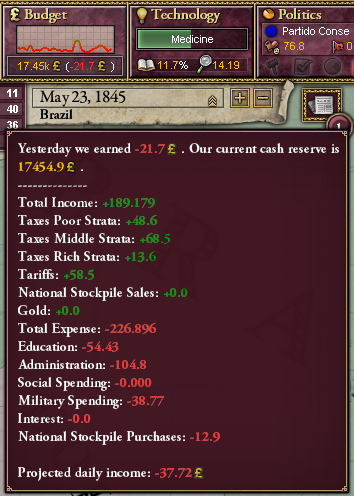 Brazil's treasury is slowly dwindling due to lower tariffs and a weak economy. 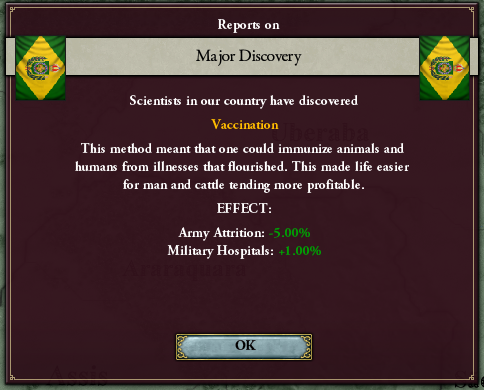 Once we finish our research into Medicine, it may be worth investing into some technologies to strengthen our production. In the mean time, we'll cut some of our spending in order to have a positive daily balance for our treasury. Cutting our Administration and Military Spending sliders will pay less wages out to our bureaucrats, soldiers, and officers. This means that people will be less likely to change to those professions, and existing pops of those types will have less money to spend on goods to meet their needs (and to pay taxes on). Ideally, I'd like to run both of these at 100% funding, but that will have to wait. 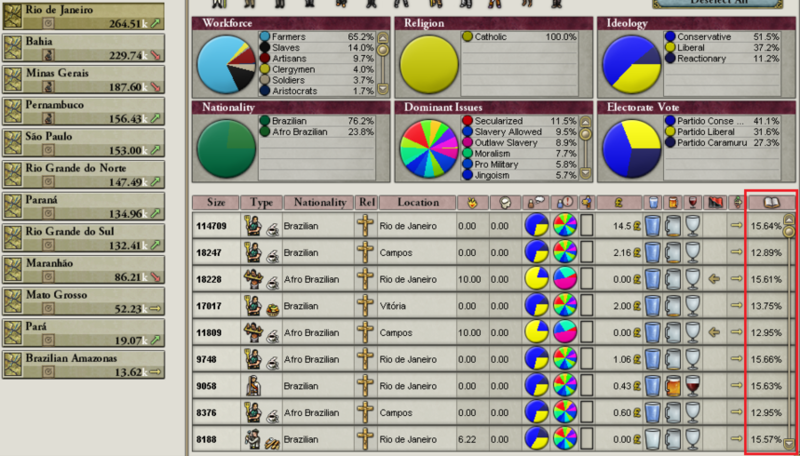 By the middle of 1845, our clergy in Rio has grown to nearly 4% of the population. This is close enough for me, so I move the NF from there to the next highest poplated state. 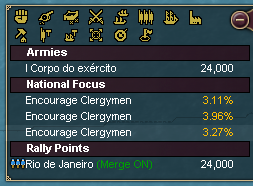 We can already witness the effects of higher clergy levels materializing in the state of Rio. 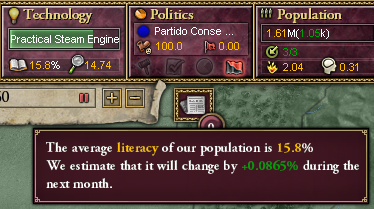 While the average literacy of our total population is only around 11%, it looks like the pops in Rio average to around 14% or more. Compare the literacy in Rio to São Paulo, which we haven't targeted with a clergy NF yet. 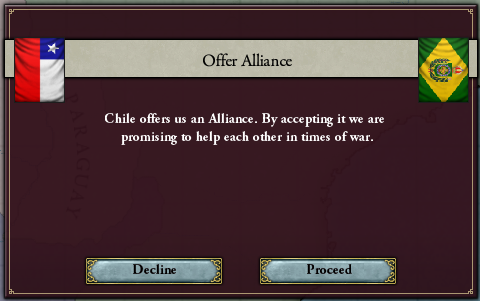 Chile wishes to restore our old alliance. I probably should have stuck it out and continued to help them in the first place, so I decide to accept. We finish our research into medicine. This makes it easier for us to move larger armies around in our low supply limit provinces, and opens up the possibility for us to discover those exceptional population growth increasing inventions. The next three technologies I plan to get are these from the Commerce tab. The first three techs in the Market Functionality column provide a more than decent +10% to mining and farming output in all of your provinces. If our RGOs produce more, the pops who profit from them will earn more money and in turn increase our tax revenue. We don't have any coal or iron, so it might seem like the bonus to mining is wasted on us, but I think that it may actually apply to our timber and luxury wood RGOs as well, since those are collected by laborers rather than farmers. The second tech in that column, Market Structure, also has a few decent inventions related to factories. Those would be nice to have a chance to get before we start building real industry. 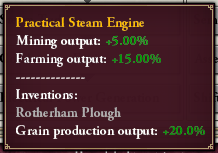 Input and Output Efficiency are both very good bonuses to stack on our factories. If a factory could normally produce 100 steel by using 100 coal and 100 iron, 10% input efficiency would allow them to produce 100 steal with 90 coal and iron. Adding on 10% output efficiency would allow that factory to produce 110 steel with 90 coal and iron. Throughput tech essentially allows a factory to do more work with the same amount of people. That factory which could produce 100 steel with 100 coal and iron per day with +10% throughput would be able to produce 110 steel using 110 coal and iron per day. We don't have factories yet, but it will help us in the future. 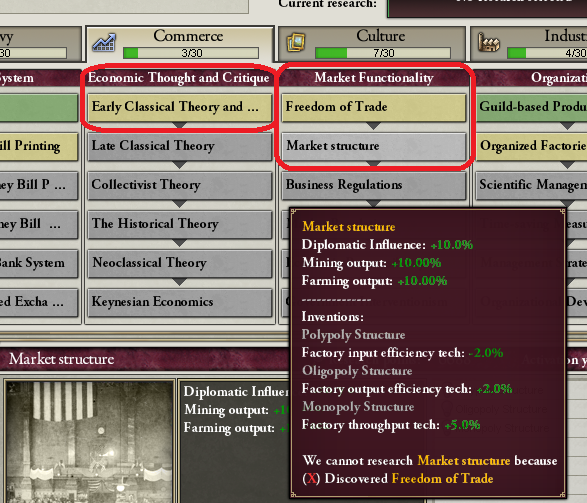 Finally, we're getting Early Classical Theory from the Economic Thought and Critique column because it includes the inventions which allow us to create lumber, furniture, and luxury furniture factories. The Luxury Furniture industry will probably be our nation's biggest moneymaker in the future, so I want activate the chance to invent that type of factory. Those first row techs are researched relatively quickly for us, now. As time passes, technologies which have been available for years become cheaper and cheaper to research. Combined with the fact that we generate far more research points per day now than we did in the beginning, and these techs are coming much more quickly than before. 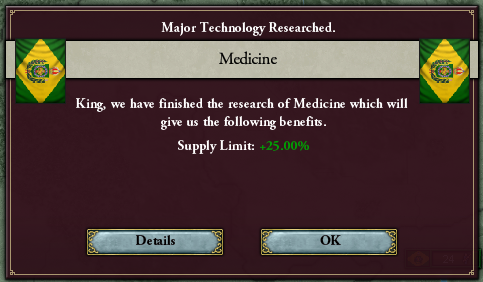 Some of the inventions from Medicine also contain useful combat bonuses. 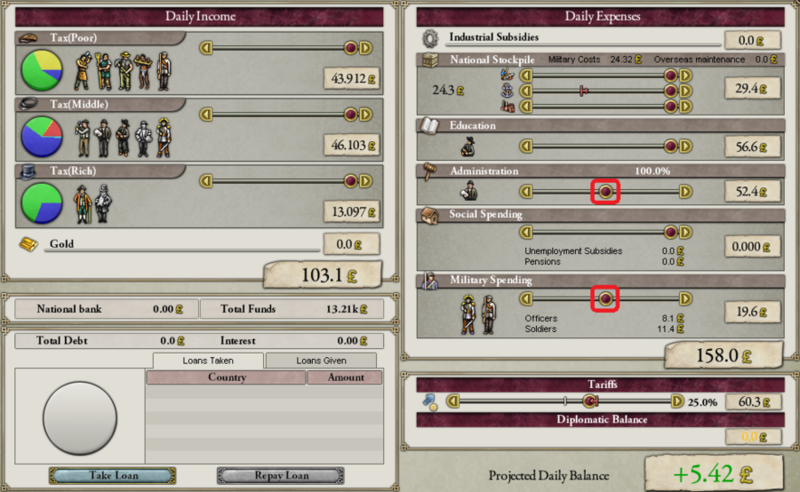 A reduction in attrition (troop loss from non-combat reasons) is always nice, and the military hospitals bonus means that some of the soldiers who are lost in battle are not actually killed, but instead just returned back into the pop that their regiment is tied to. From there, they can be reinforced back into the unit over time. 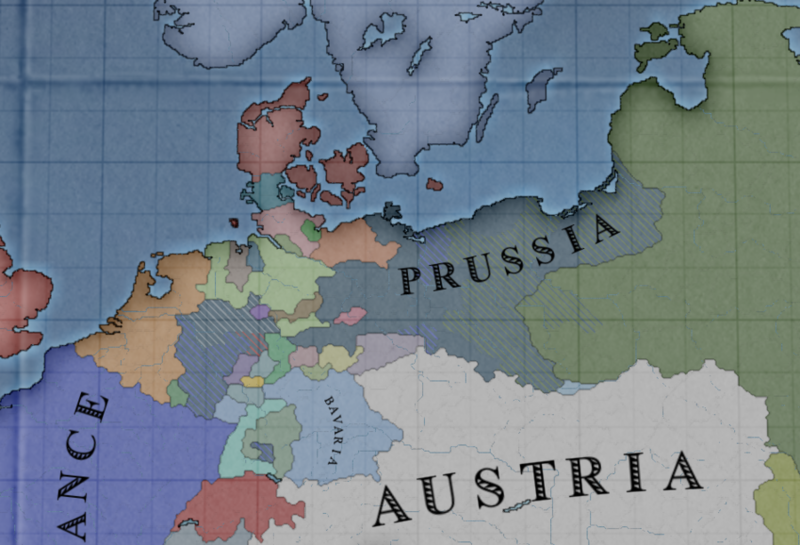 Meanwhile in Europe, Prussia has found itself in a pretty bad situation. 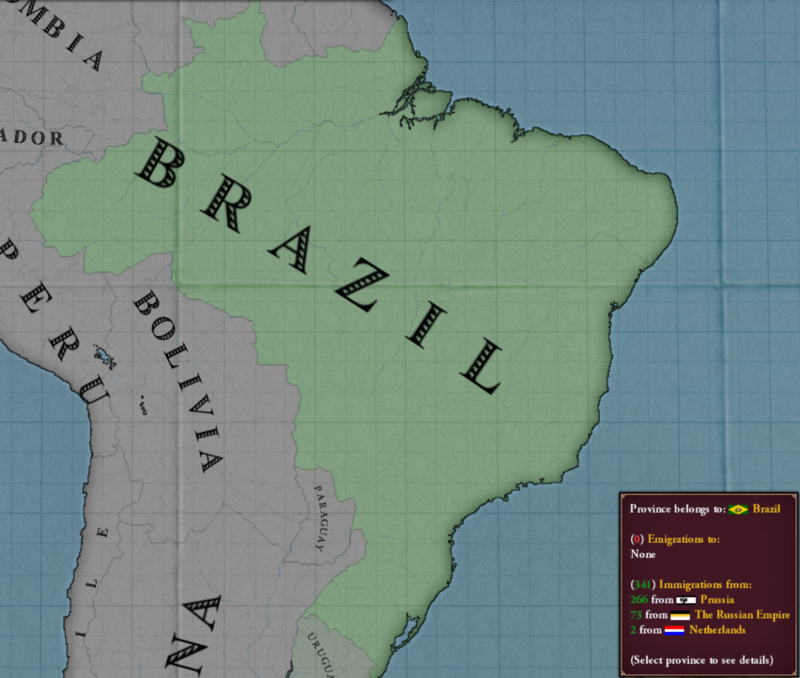 They're fighting against France and Russia both at once, and have had a significant amount of their nation occupied for a while. 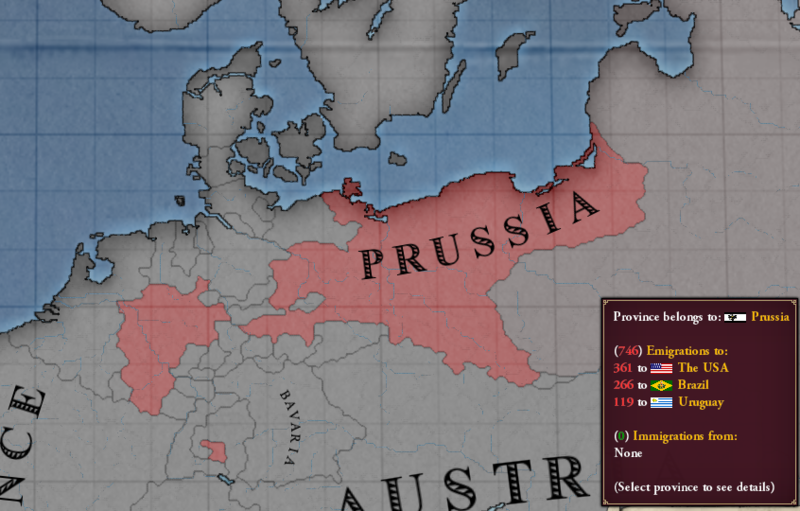 The war is dragging on because Russia is demanding a costly war goal which Prussia is unwilling to give up easily: their eastern state of Westpreußen. 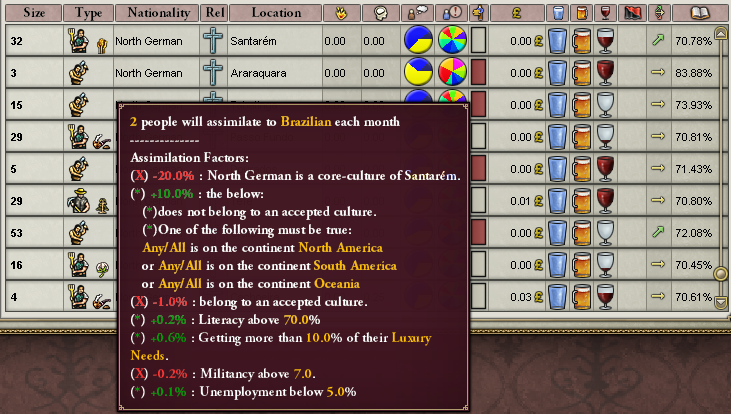 The game is set up in such a way that strife in Europe tends to drive immigration to the Americas. 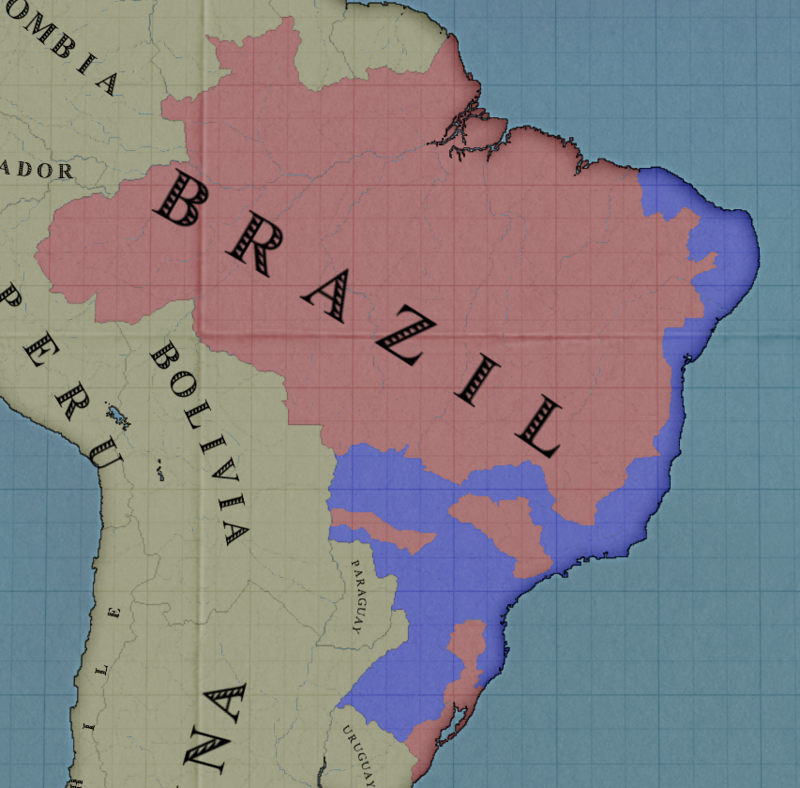 The Immigration map mode shows this in effect. While mass immigration from Europe doesn't really occur in large numbers this early in the game, it can still materialize due to temporary crises. We can check ourselves with the Immigration map mode as well, to see how many immigrants we have received over the past month and where they've come from. Immigrants arrive throughout our country: farmers, craftsmen, and laborers for the most part. Gradually they will assimilate into our native culture and join the ranks of already existing pops. Look at their literacy! I'm not sure if it gets transferred into whatever Brazilian pop that they assimilate into, but that would definitely be nice. By the time we finish researching Freedom of Trade and Market Structure, we're actually running a pretty healthy daily balance once again. Our poor and middle wealth pops are also more easily able to provide for their needs with the higher wages coming from higher production. We're going to continue with the process of boosting our production and economy by grabbing some techs from the Industry tab next. 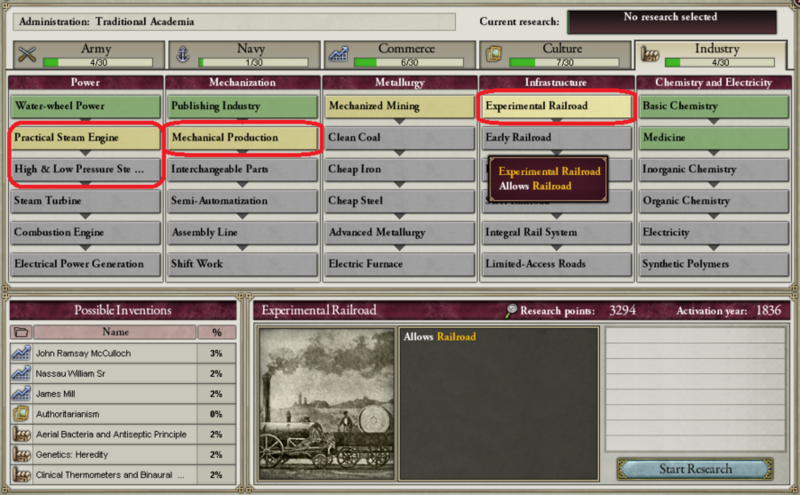 The first target will be Experimental Railroads which should research pretty quickly. Each tech in the Infrastructure column raises the level of railroad infrastructure we can build in each province by 1. 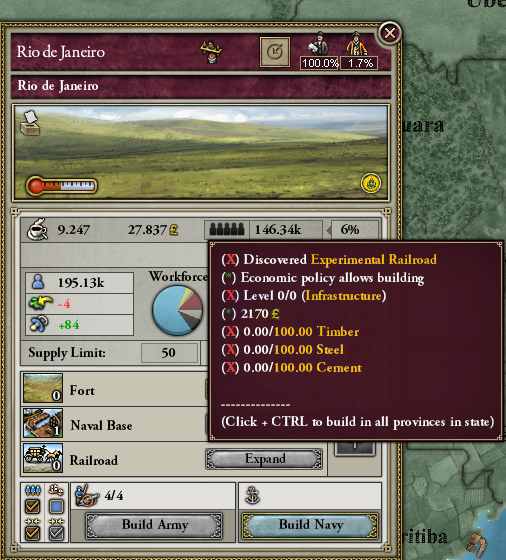 Railroad infrastructure is pretty great, as it gives bonuses to several things. 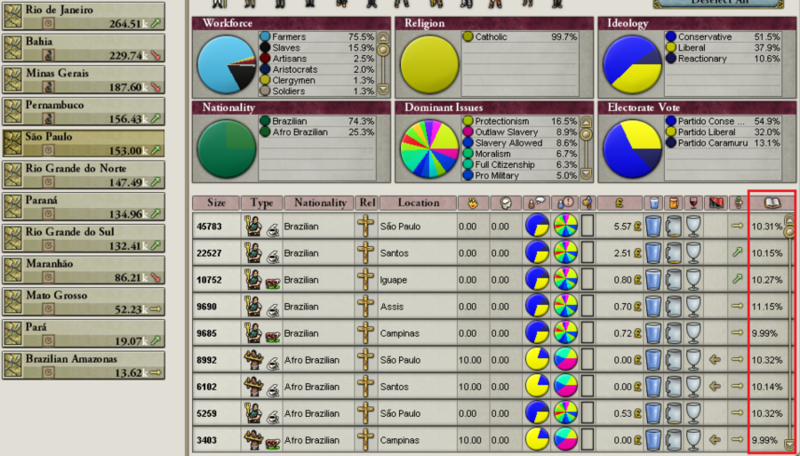 It raises the supply limit in provinces where it's present, allowing for bigger armies and allows armies to move more quickly through those provinces as well. They also provide state-wide bonuses to RGO output and factory throughput. Next, I'll aim for the next two technologies in the Power column. Much like the first few technologies in the Market Functionality category under Commerce, the technologies in the Power category all provide bonuses to Farming and Mining output. This will strengthen our economy even further, putting more money in the pockets of our pops. Mechanical Production by itself provides a small bonus to factory throughput. That's fine, but the real reason we're getting it is for its possible inventions. There are 4 separate inventions associated with it that would give us an immediate bonus to the output of our timber and tropical wood production as well as our fruit production, which we have a decent amount of. This technology also allows us to unlock Machine Parts Factories, which are pretty important. Machine Parts are a construction and upkeep component needed for most other factories. Even if we don't have the raw materials to make them, we'll probably want at least one so that we can make machine parts locally with imported raw materials. I can select each input on the trade window, such as Timber here and uncheck the Automate checkbox. 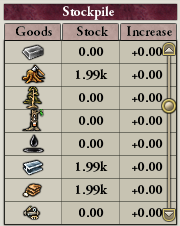 Then I can slide the stockpile slider up to 2000 units and hit 'Confirm Trade'. This will make us attempt to keep a stockpile of 2000 timber on hand at all times. I repeat the same process for cement and steel. Even if the goods are widely available on the world market, one thing you will notice when beginning several constructions at once is that the AI slowly buys inputs for each project one at a time. 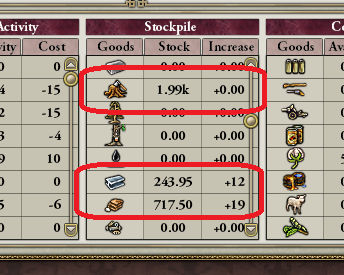 So if you queue up 20 railroads, you'll see it spend 10 days buying up the resources for one, then another 10 days buying up resources to begin the second railroad and so on. You would end up having your first queued railroad finish 200 days before the last in the list using that default process. By stockpiling these goods beforehand, queuing up those same 20 railroads would result in all 20 of them instantly beginning construction immediately. 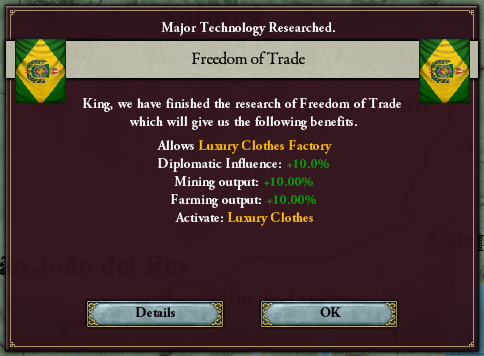 Of course, those goods aren't free. It puts a big drain on our budget to buy up all of those goods while our stockpiles are filling. In the end, our stockpiles are filled to the brim with building materials, and those extraordinary stockpiling expenses cease. I somewhat overestimated the total cost of stockpiling all of those goods, though. 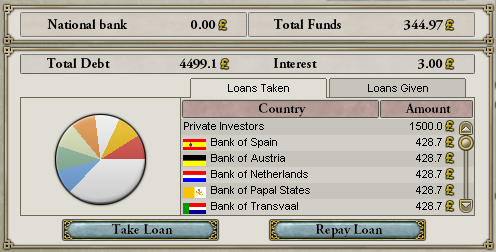 In addition to spending our entire treasury, I also put us into about 4500 pounds of debt. With our budget back to normal, it shouldn't take long to pay this off though. 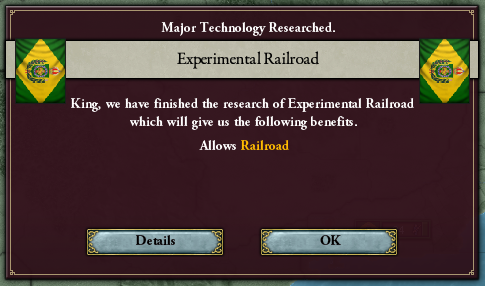 Research into basic railroads is complete, but we'll need to wait for a while to begin construction on them until our treasury is back to a reasonable level. Infrastructure map mode (hotkey E) will show us exactly which provinces have railroads, which can potentially have some, and which have terrain that is too rough for our currently available level of railroads. The blue indicates areas where we can build. While we wait for our treasury to recover, research continues on our other planned industrial technologies. Our literacy and daily research points are still on the rise, and as we continue to strengthen our economy, our treasury will fill faster and faster as well. Very soon we'll be at the point where we can begin construction of our first railroads, and I plan to have construction on our first few factories begin within the next few years as well.